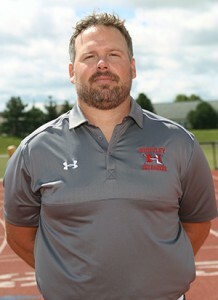 Huntley High School is excited to announce the appointment of Mr. Matt Zimolzak as its varsity football coach for 2016. Coach Zimolzak has been part of the Red Raider football program the last four years, the last three as defensive coordinator. This past season, the defense he coached helped lead HHS to its first undefeated Fox Valley Conference (Valley Division) title and run in the Class 8A playoffs that ended in the second round. Prior to joining the HHS staff under former head coach John Hart, Zimolzak was a longtime assistant at Palatine’s Fremd High School under Hall of Fame coach Mike Donatucci. Administrators agreed his experience coaching on both sides of the ball under two coaching legends helped distinguish Zimolzak from other candidates. Zimolzak is a 1991 graduate of Savanna High School in Anaheim, CA. He continued his education at Beloit College in Beloit, Wis., where he was a three-year letter winner in football as well as Presidential Scholar. He also earned a master’s degree in teaching from Roosevelt University. He has taught AP Physics at Fremd since 1995. He and his wife Erika have two children, Connor (15) and Kara (12).